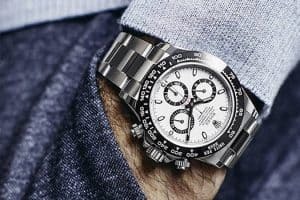 In our last two-part guide to dressing for your body type, we outlined the everyday tips and techniques that a tall man should consider when putting together outfits, along with the key pieces he should be looking to add to his wardrobe. Today, it’s the turn of the shorter man. In my experience as a stylist, concerns shorter men have when dressing often revolve around two areas: the first being the fear of appearing both short and plump, and the second being that clothes feel too large, therefore giving off the impression that he is wearing his father’s hand-me-downs. Today, we will be looking to address these issues by showing you how to lengthen the shorter man’s frame and overall proportions through specific fits, whilst also exploring different ways to shift focus to the areas we want to highlight. 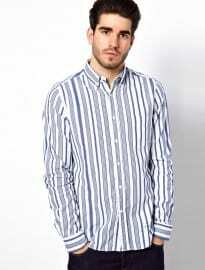 When it comes to buying clothes or selecting an outfit, you must always remember that your aim is to streamline. This is a term that will appear regularly throughout this guide, and should be the ultimate aim of the shorter man. Piecing items together that will ultimately appear to lengthen your body or visually extend your silhouette is vital. There are several ways in which this can be achieved and many are simple tweaks that will soon become second nature. It doesn’t matter if you are slim, well-built or overweight – the goal is the same: you want to draw the eye up and extend in height. Remember that the tips and techniques outlined below should be used as a guideline, so make sure you apply them according to your own individual shape and needs. The ideal and most effective palette for this body type is one that revolves around monochromatic hues, or black and white. When combined with classic muted colours such as brown, charcoal, oxblood and olive the result will be both productive and timeless. The idea behind this is that dark colours work together to lengthen and extend. It’s a well known fact that black is slimming, so using that concept as a foundation, a mix of darker hues offers a similar effect whilst introducing a spot of colour – preventing your outfits from becoming stale or repetitive. Navy belongs in every man’s wardrobe as it complements a large majority of skin types and never goes out of fashion. It also works to streamline in the same way as black, and can be paired effortlessly alongside other shades of blue (on trend) to create versatile, tonal ensembles. When introducing lighter colours, avoid bold contrasts. Try to integrate lighter shades of grey, cream and white in such a way that it softens the look, rather than breaks it up. Important Note: with the fashion industry dominated by the taller of our species, the lookbooks today will be exploring the concepts of each section, rather than being perfect examples of how to dress as a shorter male. For example, below are a selection of tonal outfits and palettes you can take inspiration from, yet some of the other concepts will be in direct conflict with other advice we provide today, such as trouser turn-ups, going socklesss etc. 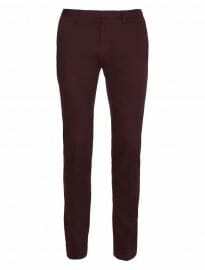 The simplest way of drawing the eyeline up is to wear darker colours on your bottom half and lighter colours on top. Keeping in mind that you want to avoid harsh contrasts and breaking up the vertical line too much, mixing both light and colourful tones with shades of black and navy will help show individuality as well as a firm grasp of colour concepts. Think navy with red, black with grey/white, olive with mustard and charcoal with plum as possible colour combinations for you to try. As well as wearing lighter shades on top, accessories are a quick and easy way to add a pop of colour. A plain/printed scarf or narrow tie will inject life into your look whilst simultaneously acting as a welcome focus point. You can afford to be a bit more adventurous with your choice of colour when it comes to accessories, although keep scarf length to a minimum (through your choice of knot) and avoid anything that widens your frame too much. 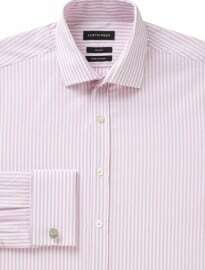 With the Breton stripe previously highlighted as a tall man’s best friend, it seems only logical that a vertical stripe should be a close companion of the shorter man, right? 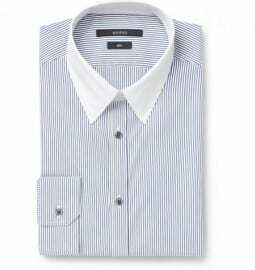 Its instant lengthening effect can be effortlessly worked into an outfit wherever you need it – either as a pinstripe option for formal wear or simply on a shirt or tee. 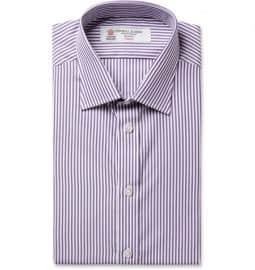 For those who prefer a slightly more retro style, vintage shirts often feature vertical stripes in their design, whilst long floral prints work equally well to the same effect. Just something to remember the next time you go vintage shopping. Another pattern that complements this body type is dip-dye detailing. Particularly big this season, designers create dip-dye effects through the gradual blending of two colours – traditionally utilising a darker hue at the bottom and a lighter one for the top. Not only is this currently on trend but it is also a summer-appropriate look that many body shapes can easily adopt. Due to the nature of the design, it naturally draws the eye upwards, which is why it is ideal for shorter men. When it comes to larger prints or patterns, avoid any that are too bold. Large florals (rather than thin and long) or colour-blocked pieces will both widen and break up your vertical silhouette, which should be avoided when attempting to streamline. 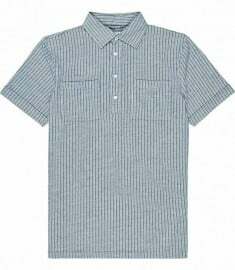 Instead, consider the many subtler alternatives that are available on the market, such as contrast cuffs, linings or shirt collars. These will add a playful edge to your look without drawing too much unwanted attention to your shorter proportions. If layered intelligently, a printed shirt can be worn effectively under a jacket and, similarly, a printed tee can work under a shirt. However, this will be covered in more detail within in the layering section below. Slimmer fits will always complement this body type best. Comfort and looser fits automatically add width instead of height, so you are much better off going for a slightly tapered cut. The extent to which this advice is taken on board depends entirely on your personal shape. Skinny and slim cuts will fully emphasise and elongate leg length, yet larger men or those with big thighs may feel uncomfortable wearing such styles. In this case a tapered or ‘carrot’ cut would be best, whereby the trousers have more room through the thigh – comfortably fitting in large/muscular thighs whilst also helping keep a larger man’s mid-section in proportion – and then taper in below the knee to the ankle, providing a similar effect to a slim/skinny cut. 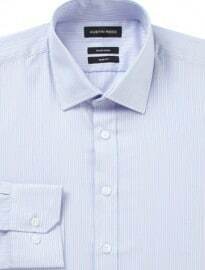 The same applies to boxy fitting shirts – look instead towards slimmer styles that fit tighter to the torso. As is the case for tall men, inseam length is vital. Shorter men would benefit from little to no break on their trousers/jeans, as pooling material around the ankle will only serve to shorten your silhouette and break up the vertical line. With this in mind, either get your trousers hemmed to the correct length (or do it yourself) or ensure you buy the correct inseam length. Are you really a 32R or should you only ever consider 30″ inseam or below? A large majority of menswear brands now base inseam length on waist size. Therefore it is imperative, especially if you have a larger waist, that you shop around and gravitate towards brands that actually offer traditional S/R/L length trousers and jeans – it may take some effort to find those that fit perfectly but your look will thank you for it. Alongside using colour or layering to streamline, certain pieces and styles will also naturally elongate. Experiment with collar sizes and narrow lapels as when worn correctly they will not only draw attention upwards but simultaneously lengthen the neck and narrow your frame. Hats are a great way to instantly add a few inches and with so many styles to choose from, all that is left to decide is whether you feel confident enough to pull one off. Footwear shape can also work to heighten, with the most obvious technique being the addition of a heeled sole. However, a slightly more subtle approach is to opt for a pointed toe, rather than rounded, as they visually lengthen the foot and, subsequently, the leg. In order to remain proportionately balanced, some traditional menswear ‘rules’ have to be bent slightly when it comes to dressing – one major one being shirt and cuff length. Generally it is recommended that 1/2 to 3/4 inch of shirt cuff should remain on show under your blazer or jacket. However, as a shorter man, as little as a 1/4 inch is ideal – any more than this and it will appear to shorten the arms. Consider jacket length too: they should be neither too long nor finish short on the waist. Other quick tips to bear in mind are: lose the belt in order to add visual length to trousers/shorts; gravitate towards one or two button jackets, rather than three; look for closely placed together pockets that help narrow and lengthen the frame; and avoid trouser turn-ups/rolls, which break up vertical lines. All these small details may seem insignificant but when incorporated accordingly the result will no doubt be a positive one. Layering is often used as a way of bulking out or widening a silhouette but it can just as effectively be used to narrow and lengthen. When looking to narrow and lengthen, you should work the colours inward. For example, if a dark jacket/blazer is worn over a white shirt/tee the lighter hue will create a more prominent vertical line, thus helping to visually extend your torso. This concept can be pushed further: try wearing a jacket over a shirt, which itself is layered over a tee. If the top two pieces are left undone, the jacket and shirt will shape the narrow, prominent line formed by the tee. You could also experiment with a printed shirt in this instance, as it will help create two lines either side of the centre (almost creating your very own take on a horizontal stripe pattern). Finally, remember not to layer longer pieces underneath shorter ones as this will only break up your vertical silhouette. So there we have it, some general guidelines to consider when dressing as a shorter male. The key is to try and streamline/visually lengthen your frame through colour placement and fit. In part two of this guide we will break down the short man’s wardrobe; looking in detail at the styles that belong in each section and how they can be pieced together to deliver stylish looks that both extend and flatter.